Many commentators ranging from bloggers to asset managers to Warren Buffet have expressed concern that the US Treasury has such enormous borrowing plans that it cannot possibly find enough buyers of its debt, or that even if it does then interest rates will be forced higher. I believe this view is incorrect given that we are very likely in a "balance sheet recession", and that one of the best pieces of evidence is the Federal Reserve's own data on total borrowing. This expands on one of the core points from my post on the tentatively bullish case for treasuries. 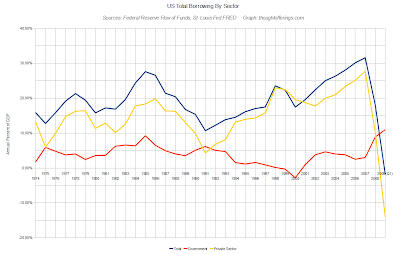 This chart, US Total Borrowing By Sector, shows total borrowing per year as a percentage of GDP along with public (government) borrowing and private sector borrowing. The tiny (ranging from around -1% to 1% of GDP) "foreign" category is included in the total but not graphed separately. The data covers 1974 through the annualized first quarter of 2009, and is from the Q1 2009 Federal Reserve Z.1 Flow of Funds report. What does this graph tell us about common assertions such as "a threefold increase in debt purchases by [current holders of US public debt] is a mathematical impossibility" and "Washington’s printing presses will need to work overtime"? Somehow the debt markets were able to find buyers for new debt ranging from 11% of GDP to 32% of GDP per year over the last three decades, yet now that total debt issuance seeking buyers has plunged to -2% of GDP per year (contracting! ), somehow the fact that the government's portion of demand for borrowing has increased is supposed to be too much for the debt markets to bear? No, the graph clearly makes the case that private borrowing is contracting faster than government borrowing is increasing (at least so far) and suggests that interest rates should be falling not rising — which they have been doing, on average, since mid 2007. A potential flaw in the use of this data is that borrowing includes both bank credit (in which money is largely "created" by banks rather than supplied by a third party) and other types of borrowing (such as bonds). Fortunately, the data on total Bank Credit of All Commercial Banks is available from the St. Louis Fed. 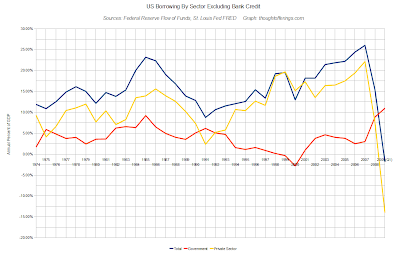 For each year's total borrowing graphed above, I subtracted the change in total bank credit for that year to estimate the total borrowing each year via other methods such as bonds. The graph below shows total borrowing less bank credit borrowing, total private borrowing less bank credit borrowing, and unaltered government borrowing (assuming that no government borrowing is bank credit borrowing). The overall picture changes very little, since the source data show bank credit ranging from 10% to 25% of total borrowing in most years, and bank credit was almost flat (contracting at a 1% of GDP rate) in Q1 2009. Now admittedly increases in bank credit (as occurred in years past) likely amplify the amount of other borrowing that can occur, given the resulting increase in the money supply via fractional reserve lending. So while I can't claim the above graph is a definitive answer to how the treasury will find enough buyers of its debt, the huge magnitude of the decline in total borrowing (to roughly flat year on year) is still highly suggestive of this conclusion. In other words, people will buy (and have been buying) treasury debt because there are on aggregate less other fixed-income asset choices available on the market, and the new treasury issuance fills the "hole" left by the shrinking supply of private debt as it is paid down or defaulted on. One counter argument might be that quantitative easing (which results in a form of money printing) has been the reason the debt has found buyers so far. There is no doubt that QE has helped supplement demand, but the program is for $300 billion of treasuries (lasting around six months) and the annualized borrowing rate of the government in Q1 was around $1500 billion, so QE has been absorbing only a minority share of the treasury issuance. So when QE ends that doesn't necessarily signal the immediate end of the government finding buyers without printing money, especially given the potential for the reflation trade to reverse, boosting demand for treasuries, as stock and bond markets realize that the V-shaped rebound and "return to normal" that is currently priced in is unlikely to last. So what about the future? Well, if reflation succeeds in taking hold, then private debt could theoretically start expanding again. But in that case the economy will appear more healthy (whether or not it is sustainable), and the government deficit (and therefore need to borrow) is likely to shrink significantly as a result! (Though perhaps with a lag and temporary spike in yields). In other words, the mix of total borrowing would just shift back to more private sector and less government. However, I think the more likely scenario is that private debt will stagnate or contract further in the years ahead as the "great deleveraging" progresses (as with Japan since its bubble peaked and the US in the initial years of the Great Depression). And as with Japan and the Great Depression, I expect treasury yields and interest rates are most likely to stay flat or decline in the years ahead, no matter which way they fluctuate in the short term, though there are a few wild cards that could change that (see the end of my related post on treasuries). Just to be clear, the point I am making is about underlying mechanics and what is likely rather than what should be or is justifiable. Sooner or later total debt needs to contract for the economy to be healthy again, and the government should not burden taxpayers by spending more than is necessary. Of course, the question of what is necessary is where things get most difficult and controversial, and I'm not going to tackle that here.